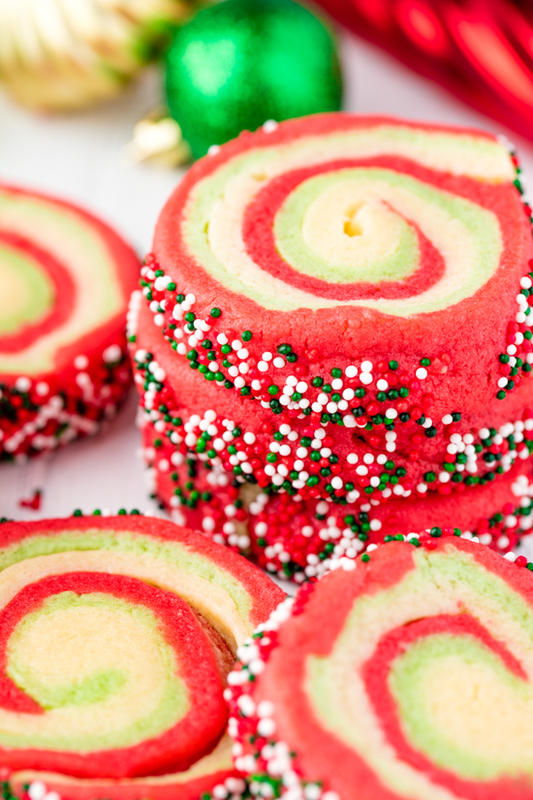 I’m getting all festive today with these spiral sugar cookies. 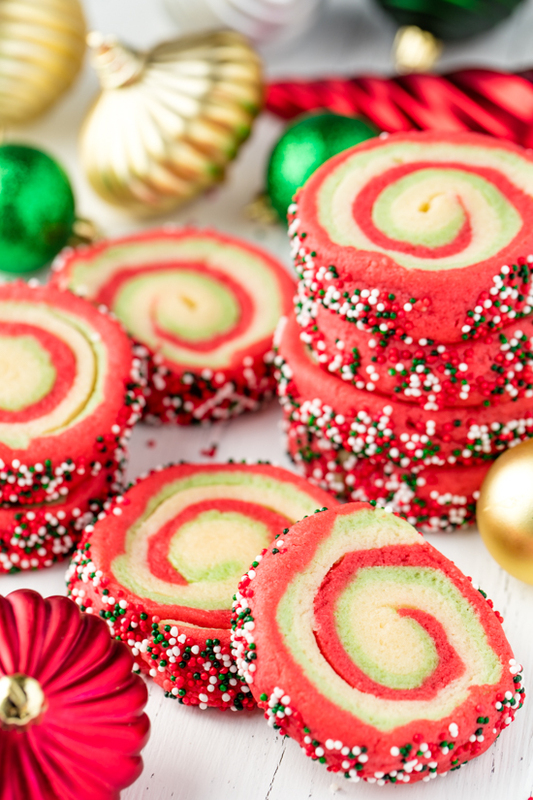 It’s all the deliciousness of my usual soft cream cheese sugar cookie, in a spiral colorful festive Christmas version, complete with sprinkles. My kids are in love with these! They have become a yearly family tradition that everyone looks forward to. I’m usually not a big fan of sprinkles, but I take exception in this case. The sprinkles add a tasty crunch on the edges of this otherwise soft sugar cookie. It is actually kind of awesome. I highly recommend the addition of sprinkles! Wondering what to do with the scraps? I would never let a good sugar cookie go to waste. I simply balled them up, flattened them, and baked them. Every cookie ends up with a different and fun design and the kids loved them. How should I store sugar cookies? Sugar cookies should be stored in an airtight container to keep them from drying out. Be sure to let them cool completely before storing to prevent condensation from forming. A large plastic tupperware or resealable plastic bag will work great. In the bowl of a stand mixer, cream the butter, sugar, and cream cheese until light and fluffy using the whisk attachment. Mix in the corn syrup, vanilla, almond extract, and egg, scraping the sides and bottom of the bowl so that everything gets mixed in. Switch your mixer attachment to a paddle or dough hook. Mix in flour, baking powder, salt, and baking soda until everything is mixed in. Divide the dough into 3 equal pieces. Leave 1 piece as is, wrap with plastic wrap, and refrigerate. For the remaining two pieces, dye one with red food coloring until desired shade is reached, and dye the other with green food coloring until desired shade is reached. Wrap in plastic wrap and refrigerate for 1 hour. Preheat oven to 375 degrees. Lightly grease a baking sheet or line the baking sheet with parchment paper. Working one at a time, roll out each colored section of dough on a lightly floured surface to about 1/8-inch thick rectangle. Try to retain the same shape for each section of dough. Stack the sections of dough on top of each other and trim off excess dough into a rectangle. Save the scraps. Roll the dough gently with a rolling pin to seal together. Working from the longer side, roll the dough tightly together. Slice off individual cookies about 1/4-inch to 1/2-inch thick. 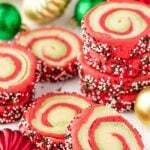 Roll the edges in sprinkles and place on prepared baking sheet. Bake in the preheated oven for about 10 minutes. Let cool on the pan for 2 minutes before transferring to a wire rack to cool completely. Store in an airtight container. I’m making these for a competition at my work and I’m so excited to see how they turn out..
Can ‘t wait to try them out with my granddaughter! What do you do with the scraps you saved? I just roll them into a little ball, press it flat and make some tie-dyed looking cookies. I don’t have a fancy mixer with different attachments. Can I use a regular mixer? All I had was a fork to mix with and they turned out great! 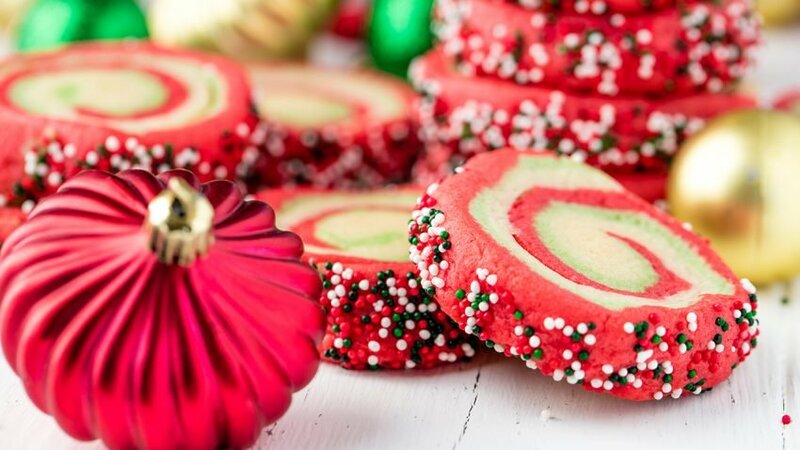 What a gorgeous festive cookie! I, o not the other hand, love sprinkles! Once rolled, can you freeze the dough? These are great!! I love how they turned out. I may have to try these this year!! I've always wanted to make these from scratch! Thanks for the recipe–pinned! This is such a pretty cookie! So perfect for Christmas!